I come from a city that has been called the “melting pot” of America, a place where the fusion of the elements of different nationalities, ethnicities, and cultures brings about something stronger and greater by virtue of such mixing, an alloy perhaps best personified by a name adopted in the last century, The Capital of the World. This honorific term has been bestowed upon other great cities throughout history such as Rome, London, and others that held the same standing as New York City now does, yet of these, one stands resolutely as an emblematic reminder of the place I call home. While there are a plethora of reasons why Istanbul and modern Turkey garner such distinction, paramount amongst these is the coalescence found through a willingness to adapt and invite foreign influences while maintaining respect for history and tradition. This combination is what affords Turkey its past, present, and future role as a “melting pot” through the centuries, where trade routes on the Silk Road now meet skyscrapers, and where a city on the straits of the Bosporus has stood the test of time as gatekeeper of the East and West. Ankara, Gaziantep, and Şanlıurfa, where we had the opportunity to imbibe not only in the cultural, historical, and religious sites, but to interact with local business leaders, politicians, journalists, activists, etc. Each of these people presented their viewpoint of Turkey’s position on the global scale and provided a broad spectrum of life from which to examine. The question that I attempted to ask in my time there and in the months since has been quite simple and yet so complex in the necessary analysis and conception of an answer: what can modern Turkey offer to the intrepid entrepreneur seeking to create a stable business relationship? As we come away from the precipice of financial collapse, new markets are sought and thus the ability to adapt and thrive are valuable qualities to possess for those seeking new opportunities. As the historical gatekeeper, Turkey’s asset of providing a link between the East and West is an essential that cannot be overlooked, and combined with a person willing to make a commitment towards such a venture, can prove bountiful for someone willing to take a leap of fate. At present, the International Monetary Fund (IMF) classes Turkey’s economy as an emerging market that is largely developed, making this nation one of the world’s newer industrialized countries.2 Turkey is among the world’s leading producers of agricultural products, textiles, motor vehicles, ships and other transportation equipment, construction materials, consumer electronics and home appliances. In the past few decades, Turkey saw rapid growth within the private sector, although the state continues to play a major role within banking, industry, communications, and transport. With the world’s 15th largest GDP by PPP and 17th largest nominal GDP, Turkey continues to show its progress and willingness to commit to improving the quality of life for the majority of its citizens.3 The nation is also a founding member of the Organization for Economic Co-operation and Development (OECD) and party to the G-20 summit of major economies. Historically, since gaining independence in 1923 until the early 2000s, volatile trends greatly affected the nation in the country in terms of both financial performance and economic growth, resulting in a then uncertain outlook for the future. In the embryonic stages, the lack of substantial human capital and hard currency reserves prevented mass economic growth as seen with other nations during this period of time. Priority was focused on providing institutional reforms to achieve stable growth with low inflation and limited volatility. By the 1930s, heightened political unrest in Europe in the lead up to World War II forced the nation to heavily rely on state oriented control to foster growth.6 Following the war and the inclusion of Turkey in NATO, private ownership, entrepreneurship, and greater participation of private capital in economic activity were adopted, with incentives for these a must. lost though, as stability began to seemingly increase by the latter half of the 1980s, during which private banks began to see a large resurgence. avoid default on these bonds.12 However, because of their continued issuance, Turkish banks become more reliant on these bonds as a primary source of investment and income. Immediate action was needed in order to keep Turkey and its people on the world stage. New regulations and reforms were enacted to improve public finance management and the Central Bank of Turkey was given an independent structure in terms of policy implementations. Asset and equity structuring in the banking sector were improved and sweeping reforms of the social security system were soon adopted. Banks were nationalized on a case by case basis, with a number of executives arrested on charges of embezzlement and manipulation of funds. In the ashes of this crisis, a new party soon rose to prominence, the Adalet ve Kalkınma Partisi, the Justice and Development Party or AKP, led by Abdullah Gül for a short 4 months. A new, secularist candidate with was soon nominated and won election as Turkey’s Prime Minister, Recep Tayyip Erdoğan. Digging deeper in the ashes, many Turkish leaders now believe that the 2001 crisis was the major catalyst for reforms within the nation, as it served to remove poorly functioning banks from the system while forcing long term economic goals for sustained growth to be achieved. Mehmet Çelik, Third Secretary of the Ministry of Foreign Affairs, noted further that his Ministry is focusing their attentions on the Middle East and striking a series of visa-free travel deals, while eyeing to establish free trade zones with other nations within the region who are willing to cooperate.28 Opportunity abounds for those who are willing to seek such avenues in Turkey, but they must do so before the market is crowded out. “As you may know Turkey is a culturally divided country, much like the U.S. actually. Erdoğan has adopted a harsh tone lately and although he did not restrict any personal freedom, his words sound like he plans to do so. I believe that is mostly because he wants satisfy the conservative ideals of this supporter base. However, it’s true that he doesn’t like cooperation with any political group. He never takes a step back, even when he does something stupid like turning a park into a shopping mall. Protests were based on this righteous demand that is keeping the park as it is. However, the underlying motivation was that people were fed up with Erdoğan trying dictate what he wants and the fact that he never cooperates with any kind of opposition. Erdoğan is man raised in tumultuous times when separation between conservatives and seculars much deeper and seculars pressured conservatives into almost non-existence. You can see in his eyes that he’ll never bow down to any demand coming representatives of the old state. He believes, by getting the votes of half of the country, he exercises the will of the nation, and it’s true that half of the country stands by him no matter what. Protesters had the moral advantage since they only wanted their park back. However, opposition of any sort saw the opportunity to act against Erdoğan and his Justice and Development Party. Soon, marginal left and racist groups joined the protests and protests took an unfortunate turn. Protesters have left their focus since the aim wasn’t the park anymore. Even when Erdoğan welcomed the protesters to hear the demands, they could not clearly communicate the demands of the protesters. This was inevitable because protesters became a huge coalition of people who know clearly what they react against but they had no idea how to construct something that would represent every single group in the coalition. Erdoğan promised to settle the issue with plebiscite, but protesters wanted keep the park until some other demands are met. In the end, the protests became an aimless invasion of the park. Having personally traveled to Turkey as part of the Rumi Forum Ph.D. Scholars Intercultural Fellowship in May 2013, my own advice to a potential investor is to experience this nation firsthand, if possible. The Rumi Forum is part of a grand movement known as Hizmet, “the service,” founded by Fetullah Gülen, which seeks to promote interfaith dialogues and improve the quality of life throughout the world. Despite the rumblings of dissent earlier this year, Turkey’s government under Erdoğan continues to provide an open, stable market to the Middle East. The Turkish economy has shown remarkable performance with its steady growth over the last eight years, with continued growth expected in the near future. A sound macroeconomic strategy in combination with prudent fiscal policies and major structural reforms in effect since 2002 has integrated the Turkish economy into the globalized world, while transforming the country into one of the major recipients of Foreign Direct Investment in its region. have paved the way for comprehensive changes and improvements in quality of life brought about by expansion of infrastructure and commerce. The main objectives of these efforts were to increase the role of the private sector in the Turkish economy, to enhance the efficiency and resiliency of the financial sector (in response to the 2001 crisis), and to place the social securit y system on a more solid foundation. As these reforms have strengthened the macroeconomic fundamentals of the country, the economy has grown, and thus Turkey as a gatekeeper has continued to stand the test of the modern era. Institutionalized economy fueled by USD 123 billion of FDI in the past decade and 13th most attractive FDI destination in the world (2012 A.T. Kearney FDI Confidence Index). 16th largest economy in the world and 6th largest economy compared with EU countries in 2012 (GDP at PPP, IMF-WEO). Robust economic growth over the last decade with an average annual real GDP growth of 5.2%. GDP reached USD 786 billion in 2012, up from USD 231 billion in 2002. With any investment, there should be a plethora of questions and considerations before major funding in an operation begins. These are dependent upon what one intends to invest their assets in, and within Turkey, the sky is quite literally the limit. This nation possesses a history spanning to the very beginnings of human society seen at sites such as Göbekli Tepe to the not so distant Byzantine Empire and Constantinople up to the Ottoman Empire and the establishment of Istanbul as the once Capital of the World. Turkey is a proving ground for the sensible entrepreneur and continues to return a profit for those with a willingness and commitment to understand the needs and wants of doing business. The immortal words of Suffi poet and philosopher Rumi stated centuries ago continue to paint a picture of Turkey for the wanderer and worshiper as a welcoming place that will resolutely stand as gatekeeper of the East and West. 15 OECD Economic Surveys: Turkey 2000/2001. 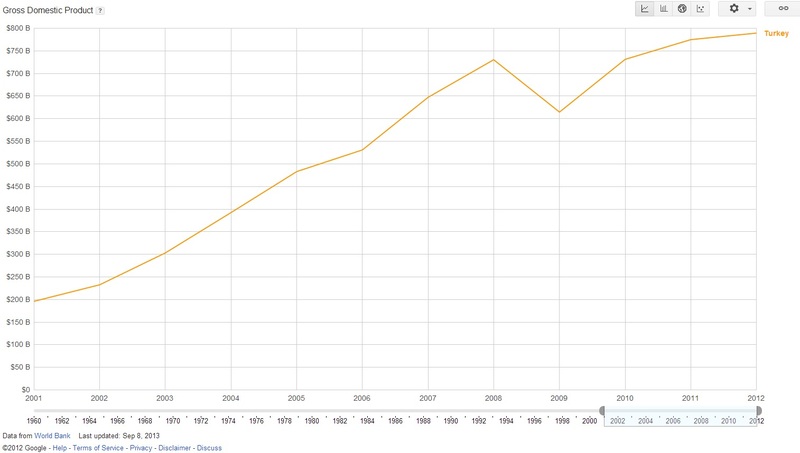 Ø OECD Economic Surveys: Turkey 2000/2001.